I wanted something quick and easy for dinner, but I had to use up some of the salmon I bought the other day. It was a great sale price on fresh, wild caught Alaskan Sockeye salmon that I just couldn't pass up so I ended up with a whole pound (this is quite a bit for it being just me!). I also wanted something light and simple since I was eating so late. I had also recently just purchased 3 dozen farm fresh eggs yesterday, so those caught my eye as I was digging in the refrigerator looking for ideas. Salmon. Eggs. Salmon and eggs? It sounds like a perfectly gourmet dish, but also perfectly healthy. And so, voilà! Enter Salmon-topped Scrambled Eggs. Light, quick, and simple but also filling. The following is for one serving. Heat butter in skillet over medium heat. While heating, season salmon with dill and black pepper. (I skipped the salt because I feel that the butter adds enough saltiness to the dish. If you disagree, feel free to add salt here.) Cook salmon in skillet to desired doneness (2-5 minutes per side depending on thickness and preference; medium or medium rare works well with this dish). While salmon is cooking, heat butter in another skillet over medium-low heat. In a small dish, thoroughly whisk eggs, paprika, ground pepper (to taste), dill, and half & half until bubbles form on top. This makes for light and fluffy eggs. Test the pan with a drip of egg. You want the egg to start to cook, but not to start frying. The trick here is low heat. Pour the eggs into the skillet and drag your spatula through the eggs as they cook. Continue to do this until eggs are cooked through. On a plate, layer first the scrambled eggs. 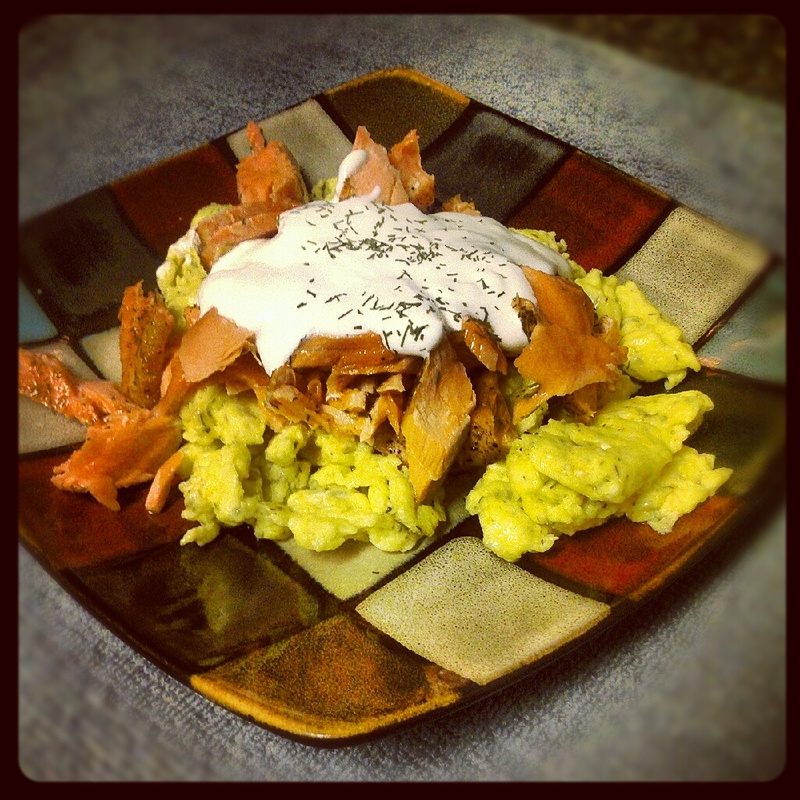 Fluff the salmon into chunks over the eggs. Top with sour cream and another dash of dill. *You can choose skinned or skin intact. Ever since my older brother recently informed me about the deliciousness and healthiness of salmon skin, I love to eat it! It tastes great when you cook it all crispy like chicken skin. If you choose skin intact, my recommendation is to season the skin side lightly with cajun seasoning and then the meat side with dill and ground pepper. Then let the cooking fat get pretty hot before placing the skin side down in the pan. Once the skin is nice and crispy (2-3 minutes), flip and finish cooking your salmon to your preference. Lower the heat some if you prefer your salmon cooked more well done so that the outside doesn't burn. You can choose to use the skin in the recipe, but I preferred it without. I just snacked on the skin while the eggs were cooking. I based my recipe off a salmon dish I found on Herb Companion. You can find the original recipe here.